Of the three types of bluebird species in the United States, western bluebirds (Sialia mexicana), eastern bluebirds (Sialia sialis) and mountain bluebirds (Sialia currucoides), none has a marked difference in the migration patterns of their males and their females. However, since females fly straight to a suitable summer nesting site while males are often forced to travel and look for territory, the females' migration to summer sites ostensibly could be shorter than the males'. Only negligible difference exists in how far female and male bluebirds may fly from their winter living habitats to their summer breeding areas. Since populations overwinter in the same places year after year and usually head to the same general areas for summer breeding, little variation exists. 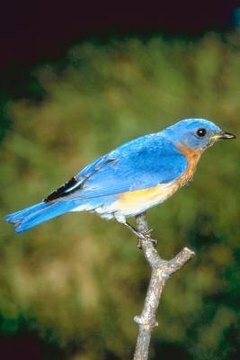 Migrating bluebird females and males join flocks and leave at the same time in the fall, heading southward unhurriedly. They search for food along the way, taking any recently born fledglings with them in family groups. Some bluebirds from all species choose to stay at summer breeding sites even during the winter, for reasons that are not entirely clear but may include an increased ability to stake desirable mating territory in the spring. In the spring, they usually flock back together. Male bluebirds of both species, however, stake out territory for nesting sites, which they must sometimes hotly defend against other territorial males. One result is that non-dominant males may be forced to fly longer and farther when looking for summer nesting grounds. Otherwise, females migrate no differently than males. While there isn’t a huge difference in how far female versus male birds will fly, great differences exist in how far different populations will travel from summer to winter resting grounds and back. Northern populations of eastern bluebirds such as those of Michigan and New York, for example, travel many miles to southern climes. Birds living in warmer areas such as Tennessee, on the other hand, usually don’t migrate, instead choosing to stay in place throughout the winter. Though they are capable of long migrations, sometimes flying as far as British Columbia and Canada to Texas and Mexico, western bluebirds may migrate for shorter distances, sometimes just down a mountain slope, for instance. The breeding range of bluebirds is considerably larger than their winter ranges. While breeding occurs throughout a wide range of latitudes, overwintering occurs mainly in the southern two-thirds of this range, if not less of it. Once bluebirds reach their breeding grounds and males stake out territory, they begin to work to attract females to their nest sites. Afterward, the female does the bulk of the work gathering materials and constructing the nest. Eastern bluebirds, once they've mated, often stay together for many years and raise several broods together. This does not mean they are always perfectly faithful, as around 20 percent of fledglings in both western and eastern bluebird nests were found, in a study, to be fathered by males other than the female's mate. This indicates that females mate with various males and possibly that mated males may not always be loyal. Couples often raise up to three broods at one time, the male focusing on feeding the babies, sometimes with the help of older nestlings, while the female focuses on building new nests and laying new eggs.